Graze the Roof: Bunker Bags full of Spawn! Bunker Bags full of Spawn! Using an urban mushroom cultivation technique as taught by Paul Staments in Mycellium Running . We created bunker bags yesterday during the workday! 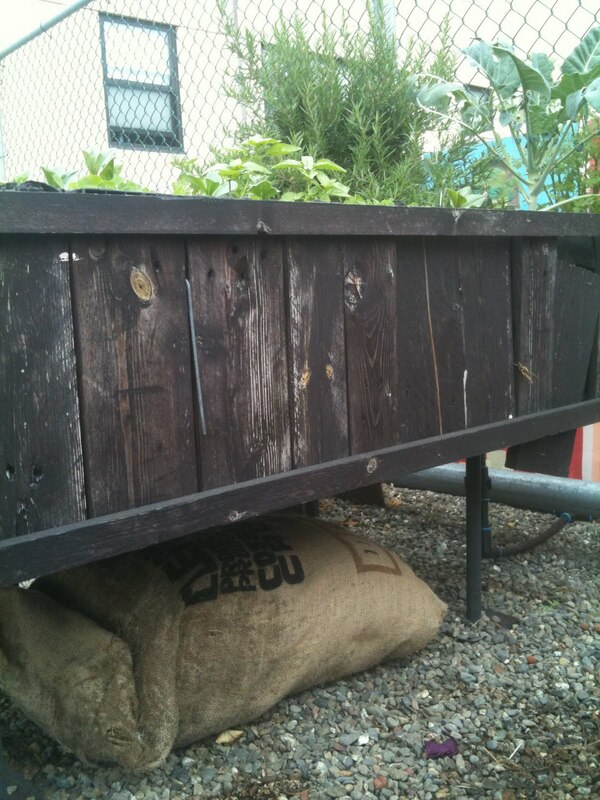 Graze the Roof now has 9 bunker bags sprinkled throughout the garden. 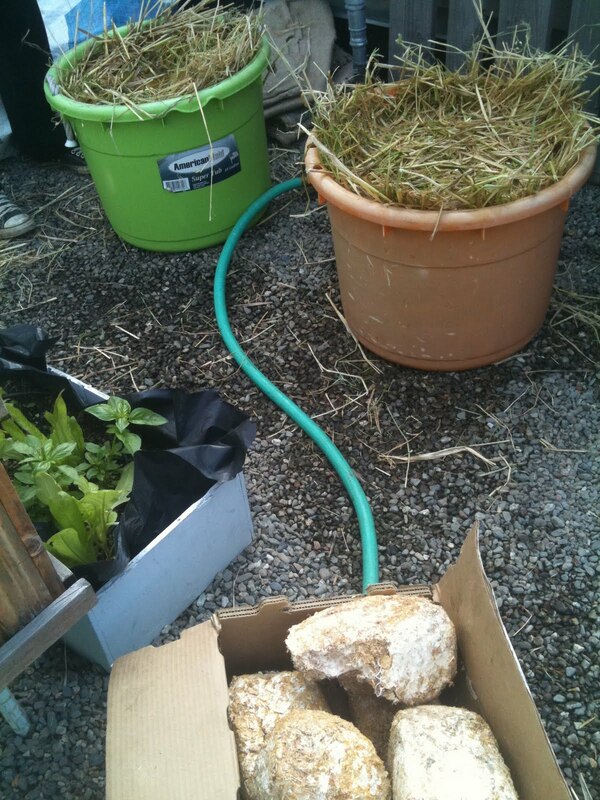 A bunker bag is a burlap sack filled with layers of pasteurized straw and sawdust bricks filled with mushroom spawn. 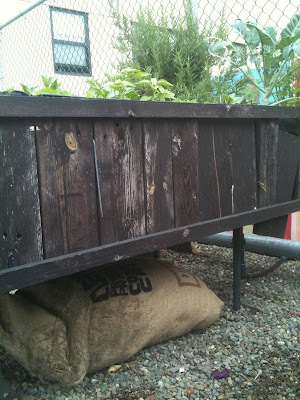 In the photos look under the milk-crate raised beds to see our bunker bags nestled underneath the crates as a shade-loving understory. Thank you to Four Barrel Coffee on Valencia St. in the Mission for the donation of burlap sacks and to Far West Fungi in Moss Landing for the donation of the mushroom bricks. And a BIG thank you to all the volunteers who came out to make it happen! Graze the Roof is an edible, community-produced vegetable garden on the rooftop of Glide Memorial Church, a progressive church and nonprofit located in the Tenderloin district of San Francisco. Graze the Roof features lightweight (upcycled) raised garden beds made from milk crates; a worm composting system and an educational mural which ties the whole project together. Glide youth and volunteers from throughout the Bay Area maintain the garden and host monthly tours and workshops. Community Work Days Come join us! No RSVP required, but for more information please email GrazeTheRoof [at] gmail [dot] com. Join us for our community workdays, workshops and rooftop garden tours! Additionally, we are looking for dedicated volunteers/interns/creationists to play a leading role in the development and continued success of Graze the Roof. There are a wide range of opportunities available - from hands on gardening and construction activities to community outreach, workshop facilitation, gardening education, fundraising and research and development. If would like to be a dedicated volunteer, please contact Graze the Roof's project manager, Lindsey Dyer at: grazetheroof@gmail.com for more information and to RSVP for one or more workdays/workshops. Your contribution will go a long way! Donations help fund rooftop garden classes, garden maintenance and expansion, community workdays and workshops.